In a devastating analysis, T. J. Coles reveals the true extent of Britain’s covert foreign policy that supports war, conflict and oppression around the world. Unbeknownst to the broad population, the Shadow State sponsors a ‘new world order’ that allies Britain with America’s quest for global power – what the Pentagon calls ‘Full Spectrum Dominance’. Coles documents how British operatives have interfered in Syria, Libya, Iraq, Iran and Yemen with the aim of deposing unwanted regimes. In doing so, they have helped create extensive terrorist networks across the Middle East, reviving previously-failing Jihadist groups such as ISIL, which has now transformed into an international terror franchise. In addition to waging clandestine wars in the Middle East, the secret services have used the military to run drugs by proxy in Colombia, train death squads in Bangladesh, and support instability in Ukraine, where NATO’s strategic encroachment on Russia is drawing the world closer to terminal nuclear confrontation. Coles unearths Britain’s involvement in the recent ethnic cleansing of Tamil civilians by the Sri Lankan government, the invasion of Somalia by Somali and Ethiopian warlords, and Indonesia’s atrocities in Papua. He also exposes the extensive use of drones for murder and intimidation across the Middle East and elsewhere. 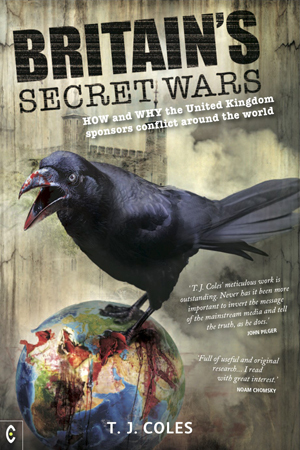 Britain’s Secret Wars is essential reading for anyone who wants to dig beneath the surface of current events. ‘Enormous achievement... What’s really impressive is the evidence amassed to confirm that the power-nexus – the political establishment, the City, the media, the MoD, plus Big Oil – just keeps tightening its grip on our collective throats.’ – Graham Hurley, creator of the DI Faraday series. T. J. COLES studies the philosophy of neurology and cognition at the University of Plymouth, UK, with reference to the aesthetic experiences of the blind and visually impaired. He is director of the Plymouth Institute for Peace Research (PIPR), editor and co-author of Voices for Peace and author of The New Atheism Hoax (both 2015, PIPR). His political writings have appeared in the New Statesman, Lobster, Peace Review and Z Magazine. He is also a columnist with Axis of Logic and in 2013 was shortlisted for the Martha Gellhorn Prize for journalism.